In my role as a national dental consultant for Veterans Affairs Canada, I have always been amazed at how much time is required to research evidence-based treatment protocols. This work is necessary, as compensation to patients in our program can only be provided for treatments validated by scientific research. I always felt it was unlikely that a relatively small weight loss (e.g., 5 kg) could alter the fit of a tooth-supported partial prosthesis, or, for that matter, a tissue-supported prosthesis. I also believed that unless weight loss was significant (e.g., over 20 or 25 kg), the distribution of fat cells, and where they are lost from first, would preclude much of a change in the supporting structures for dentures. I equated this to expecting one’s shoe or hat size to change following weight loss. To help find a definitive answer, I posed the question of what evidence exists on the relationship between weight loss and denture fit to the Canadian Agency for Drugs and Technologies in Health (CADTH)—a non-profit organization dedicated to the evaluation of research used in the development of position statements for the federal government. My position with Veterans Affairs Canada gives me access to CADTH’s Health Technology Inquiry Service, which performs thorough literature searches using strict criteria to establish the scientific validity of research. Because CADTH is an arm’s length organization, there is no inherent bias in terms of expected outcomes prior to performing a search. For my clinical question, CADTH searched for all documented studies dating back to 1999 from both dental and non-dental sources. Its report Denture Fit and Stability: Effect of Weight Loss (see: www.cadth.ca, Products/Rapid Response) found there is no proof that losing weight affects denture fit and stability. It is unfortunate that little scientific research on the subject has been performed to date. It would be beneficial if a study addressed this particular situation, considering the number of denturists and dentists who believe weight loss affects denture fit. In talking to some prosthodontists, the best explanation for this misconception is that a patient who loses weight experiences a loss of fluid, and possibly slight amounts of fat, from the cheeks. 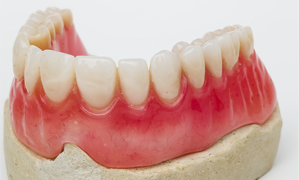 The dentures might therefore feel smaller and looser to the patient, when in fact the impression side of the dentures is still well adapted to the ridges. However, the CADTH report confirms that there is no credible evidence to allow for the early replacement or reline of prosthetics due to a patient losing weight.